The Data Center Products Group of Nortek Air Solutions, LLC, a leader and manufacturer of innovative custom and engineered solutions for heating, ventilating and cooling, today introduced the new Cool3TM indirect evaporative cooling (IDEC) unit for reduced water usage and optimized energy savings for data center cooling. The new Cool3 IDEC unit is available in 200, 300 and 400 kW standard unit sizes. The 400 kW model offers typical annual partial Power Usage Effectiveness (pPUE) below 1.1. The advanced heat exchanger technology of the unit reduces data center humidity fluctuations and filtration requirements for white space. 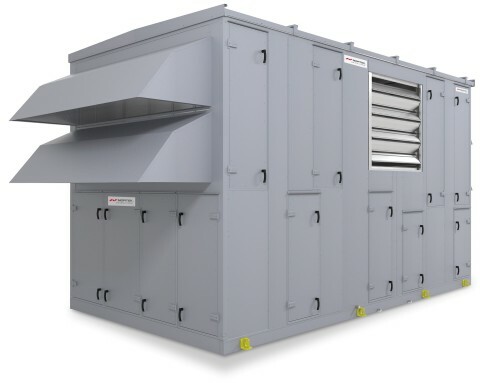 The compact footprint and weight of the Cool3 IDEC unit offers installation flexibility for new and existing data centers as an end-on unit, a rooftop unit, or in a stacked configuration. Air Economizer (Winter operation) – the high efficiency heat exchanger device covers 100% of the cooling load in the data center; the direct evaporative cooler (DEC) and the DX trim (direct expansion or mechanical cooling using compressors) are not operating. Maximizing the operating hours in the Economizer mode also contributes to the water saving advantages of the unit. Evaporative Cooling (Summer operation) – the DEC is operating, providing free cooling due to water evaporation in the DEC; the DX is off. This mode provides the most operating cost savings in locations where outdoor conditions allow. Evaporative Cooling + DX (Extreme conditions) – during extreme hot and humidity hours of the year, the unit provides trim mechanical cooling to meet the data center’s supply air temperature requirement. Due to its high wet-bulb efficiency, the Cool3 unit minimizes the mechanical cooling hours required to cool a data center in many locations and minimizes the size of the DX equipment required for extreme conditions, thereby saving even more operating costs. The ultra-efficient water system of the unit optimizes water consumption-a growing concern of data centers located in areas where water is restricted or expensive to use. The high sensible effectiveness of the heat exchanger used in this IDEC unit results in less hours of water evaporation and a substantial reduction in overall water consumption. As a result of less water usage, operating cost savings come from extended wetted media life and reduced water system maintenance requirements. Along with many of today’s leading data center cooling systems, the new Cool3 IDEC unit also features a high performance EC fan array – an advanced air movement solution that has been installed in data centers and other mission critical facilities to provide operating cost savings, high performance and redundancy. Nortek Air Solutions Data Center Products Group also offers the sEnergy EMS platform of data center infrastructure management (DCIM) software featuring the unique ActiveCFD(R) module. The module includes capabilities for real-time and continuous monitoring of white space, rack level temperatures and airflow, and also performs sophisticated what-if cooling performance analysis for evaluating future changes to data center infrastructure. Nortek Air Solutions, LLC is a subsidiary of Nortek, Inc. (NASDAQ:NTK) , a global, diversified company whose many market-leading brands deliver broad capabilities and a wide array of innovative, technology-driven products and solutions for lifestyle improvement at home and at work. Please visit http://www.nortek.com for more information.